One of the joys of being an elementary teacher is when, years later, you see your former students. You catch glimpses of the child that had once been in your classroom. 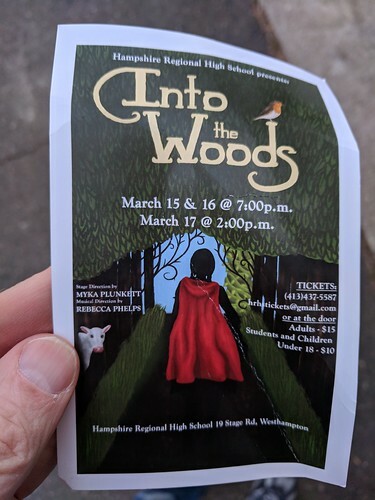 Yesterday, we took our current class of sixth graders to see a preview of a staged production of Into the Woods at the regional high school. I made it a game from my seat of recognizing those on the stage. The years gone past for many of them — in some cases, nearly six whole years — made this a rather tricky endeavor. Still, I could hear echoes in voices and I could see past days in faces. I was also wonderfully mesmerized by the talent on display for this production — which is a complicated retelling of Grimms’ Fairy Tales, with weaving story and music lines. The best part was after the preview, when the cast sat on the stage, answering questions from the audience of elementary students. They were so poised, funny, enthusiastic and … themselves, just as I remembered them (at least, those who had once been my students). They made me proud. Kevin, I have missed corresponding with you. When I saw a poem your wrote to Lanny Ball in the comment page, I jumped at the chance to read it and come visit you here. Quick Question: do you have a winter image poem to send me for my winter gallery, Winter’s Embrace 2019? Hope so. I love seeing or hearing great things about former students. Recognizing their shine from earlier years!